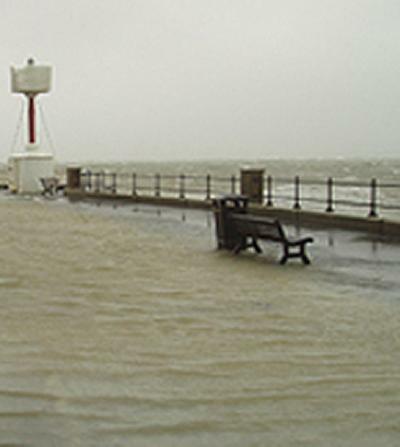 A new study by researchers at the University of Southampton has found that sea levels have been rising across the south coast of England over the past century, substantially increasing the risk of flooding during storms. The team has conducted a major data collection exercise, bringing together computer and paper-based records from across the south of England, from the Scilly Isles to Sheerness, to form a single data set of south coast sea levels across the years. Their work has added collectively about 150 years worth of historic data to the existing record of English Channel sea-level change and extended the data along the south coast. Their findings are published in the latest edition of the journal Continental Shelf Research. The data shows that both average sea levels and extreme sea levels have been rising at a similar rate through the 20th Century. The rate of rise is in the range 1.2 to 2.2 mm per year, with 1.3 mm per year recorded at Southampton. The most significant extension to the records is that of sea level changes at Southampton where the record now begins in 1935. Paper-based records at St Mary’s on the Isles of Scilly, Weymouth, Southampton and Newhaven have been used to greatly extend existing computer-based records, while the records at Devonport and Portsmouth have both been extended and corrected for pervious errors of interpretation. This new data is feeding into ongoing efforts to increase the understanding and management of flooding. The work was conducted by Professor Robert Nicholls, Dr Neil Wells from the University’s School of Ocean and Earth Science based at the National Oceanography Centre, Southampton and Dr Ivan Haigh, formerly of the University of Southampton and now at the University of Western Australia.